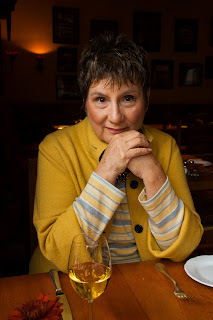 She has owned needlework stores, published 15 books, exhibited at needlework trade shows, and taught all over the country: June McKnight sounds like an expert to us. We knew we could learn a thing or two about threads and stitching techniques, especially after her latest book "Bling, Glitz and Glamour for Needlepoint" was published. As Amy Bunger once said, "June answers your questions before you know what to ask." Read on to learn from one of needlework's best, June McKnight. Q: How long have you been involved in the needlework industry? How long have you been stitching? A: The answer to both sides of this question is the same...decades. I was born the eldest child to a Polish family in Detroit, Michigan. My Mom, aunts and grandmothers lived in close proximity so evenings were often spent stitching together. My Mom took pride in the fact that she had me embroidering by the time I was four years old. After ten years of teaching in a secondary school in Farmington, Michigan, I decided to make my avocation my vocation and opened my first needlework store in Troy Michigan. It was called The Black Sheep and it opened in 1977 in a tiny strip mall. It was a comprehensive store including knitting, crochet, needlepoint and embroidery. When my television executive husband accepted a post at KGO‐TV in San Francisco we moved to Walnut Creek. I sold Black Sheep and later that year purchased The Golden Needle in Danville California. This shop was exclusively needlepoint. When we moved to the central coast in 1990, I sold The Golden Needle and I began a new shop in the historical Cannery Row in Monterey. This shop was cleverly known as Stitches by June McKnight. In 1985, I got a taste of the wholesale side of our business assisting Design One, owned by Carol and Hal Shirley and later Erico with Peter and Lydia Truce. Early in 1994, I introduced my first book, Christmas Stitches to the wholesale market with the help of Erico. I have since been exhibiting at TNNA under my own banner, JUNE MCKNIGHT BOOKS. Today, I have 15 books in print. Five of them, Best Bargello, Bling, Colorful Stitches, Spooky Stitches and Christmas Medallions, are printed in full color. And I am proud to add, they are printed in the USA. The distinctive flip book format is my brand. Q: Where did you get the idea for your newest book, "Bling, Glitz and Glamour for Needlepoint"? A: There is a maxim in the home decorating industry that what women wear, influences how they decorate. This transition from apparel to decorating generally takes about 18 months. Early in 2011, I had the pleasure of viewing the Balenciaga exhibit at the de Young Fine Art Museum in San Francisco. At every turn the designer’s Basque heritage was evident in the elaborate braids, embroidery and beads that embellished coats, capes, dresses, hats and shoes. It was awe‐inspiring. But glitter was also coming on strong in the everyday wear in my own community. Sequins, paillettes, jewels, rhinestones, pearls, and beads were glamorizing everything from headbands to shoes and everything in between. The world seemed ready for a little glamour on needlepoint. I was eager to speed this transition from clothing to needlepoint. The real turning point came for me when I observed that glittery items were becoming available at our TNNA trade show in the summer of 2011. It would make no sense to encourage our customers to bling up their canvases if the glittery materials were not available. Adding to such long time exhibitors like Mill Hill and Sundance, suddenly Beadsmith, the collection and Embellishments made dye cut sequins, rhinestones, pearls, and bugle beads easily accessible. Tools and supplies that usually were available only to jewelry designers were now part of the TNNA wholesale market. The timing seemed right to launch BLING, GLITZ AND GLAMOUR FOR NEEDLEPOINT. The record breaking sales on this little book has proven my theory to be correct. Best of all, Bling has brought younger people to our retail stores and given a fresh and youthful perspective to needlepoint. It is truly not your grandmother’s needlepoint any longer. Q: Is it a book of projects, or more of a how-to, stitch-illustration book? A: Amy Bunger once commented about my books. “June answers your questions even before you know what to ask.” I like that quotation and it is really true. Since my formal training is as an academic, I approach every topic with a need to know every detail. I learn so much from the research I give every subject. My books are not just a study of stitches. They are a glimpse into the products and techniques that will guarantee success to any stitcher of any level of experience. I hold the hand of the beginner and I challenge the most experienced. No, these are not project books, rather they are colorful user friendly inspirations for any painted canvas that is sold on the wholesale floor. Q: What is “bling” in needlework? A: Bling in needlepoint is merely the substitution of a glittery product such as a bead, sequin, rhinestone or jewel for a needlepoint stitch. The embellishment can be added on top of an already stitched area or it can substitute for a needlepoint stitch. In this way, the design can come to life with more glitter and sparkle. Q: How are Kreinik threads used in the book? A: Kreinik Metallic threads are the perfect companion to anything glittery. There are many stitches in the book that combine both. Q: Do you have a favorite Kreinik thread? Q: Are the techniques in the book for beginners, advanced stitchers, or all levels? A: My books are for all. Beginners get some gentle hand holding and the more advanced are challenged to become all that they can be. Q: What is one main tip or suggestion for someone who may be hesitant to try bling on their needlework? Q: Will you be teaching some of these techniques or any designs in the near future? A: Yes, I have been teaching the Bling techniques in California at Old World Designs in Menlo Park, Monarch Knitting in Pacific Grove and several other locations. A Bling class was offered to retailers, teachers and designers at TNNA – Columbus. Melissa Shirley and I are currently collaborating on a Bling Kitty to match our Boo Kitty. If all goes as planned, Bling Kitty will be taught in the summer trade show, 2013. Q: Where can stitchers get more information about your books or purchase them? A: Thought you would never ask. If you are a retailer, my books are available to the trade at www.junemcknight.com or at Unicorn Books. If you are a retail customer, check with your local needlepoint store for a copy of your favorite June McKnight book. My web site lists the retail shops that support my endeavors. Alas, I do not sell directly to retail customers because I want to support small businesses in any way I can. Vacation is a wonderful time of the year. Here at Kreinik we traditionally close down for July 4th week so that we can have down time to relax and recover. The past three years my wife Myla and I have gone on driving trips to see different areas of North America. Four years ago we went to walk on the ocean floor in the Bay of Fundy. Two years ago we sought out the source for thimbleberry jam on the Upper Peninsula of Michigan at Cooper Harbor. 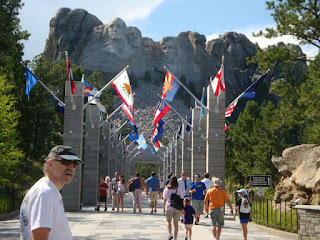 This year it was time to visit five states in the US that I had not seen. 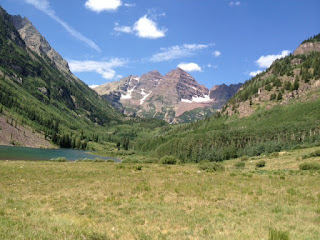 We first went to the Aspen Music Festival with extended family—great fun, great food and great listening. We saw Maroon Bells, the most famous topographical site in Colorado (twin, snow-capped peaks with a maroon hue) and attended a very wet, rainy rodeo. 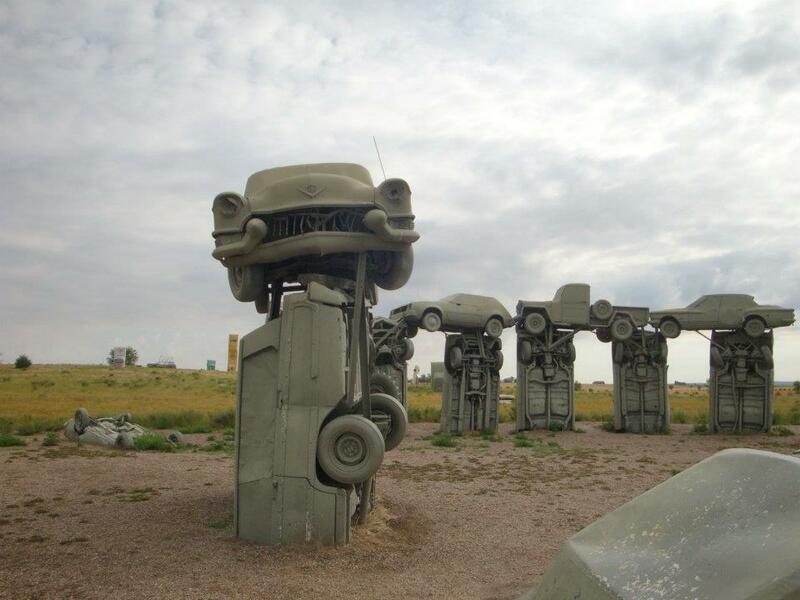 We aimed the car towards Nebraska and found Carhenge, the Druid sister to Stonehenge except built with old Cadillacs and Valiants from the 60’s and 70’s. That it was in western Nebraska where the land is very flat. 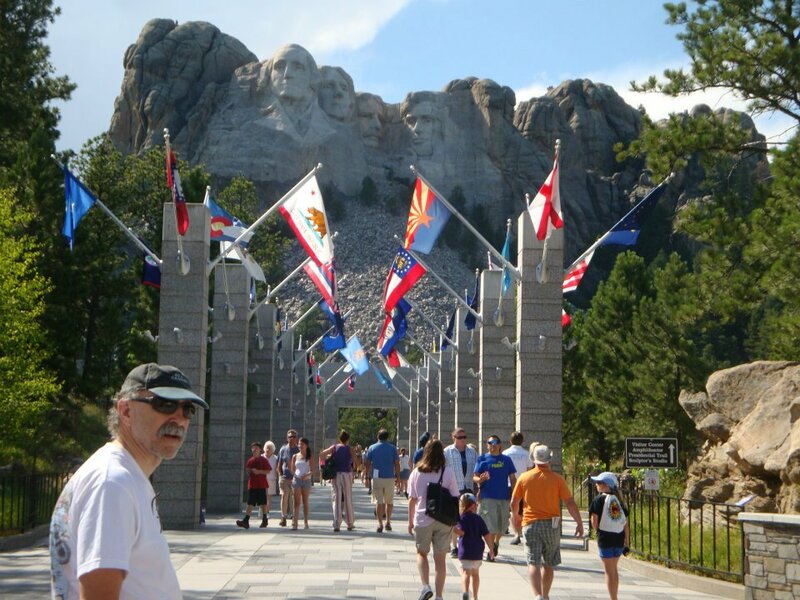 Into the South Dakota Bad Lands with its largest area of stabilized sand dunes, we meandered to Hot Springs, drank some mineral water, and viewed the local historical museum to learn about the pioneers, Custer and the Lakota Sioux. We went on to North Dakota. Here we met other people from West Virginia, which shocked us and them, as it is pretty far from our home state. The city of Bowman had a museum on the dinosaurs from 650 million years ago, on local pioneers, and on the regional Indians. We like visiting museums and learned a lot about Native Americans on this trip. Across the barren southern portion of Montana, we were surprised to find that the Little Bighorn was not in ND or WY, but in Montana. It was amazing that Custer rode hundreds of miles on his charge to halt the Sioux. 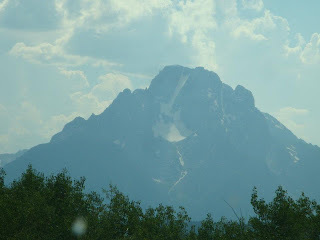 Many recommended along the way that we enter Yellowstone via Bear Claw Pass (the northeastern entrance) - an 11,000 foot pass with lots of switch backs, precarious cliffs, Alpine lakes and breathtaking scenery. We reached the top of the world and were even with the peaks far to the west. These glacial-capped tops were beautiful, but alas, we did not drink any of the snow melt. 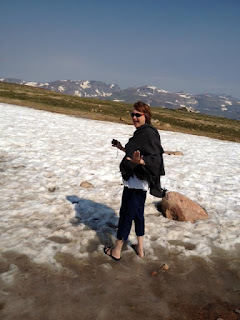 Myla stepped carefully onto the glacial snow for the experience. 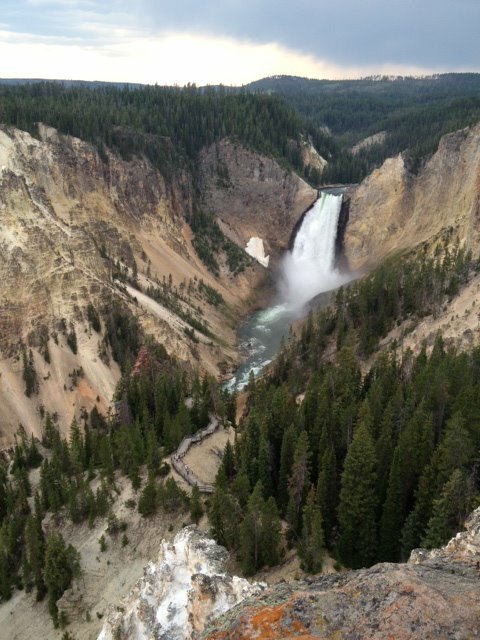 The road high atop the park led into the plains of Yellowstone, the buffalo, waterfalls, bears and fumaroles. Traffic stopped everywhere to “photograph” buffalo roaming next to the cars. Getting “close” was not my idea of smart; we had seen photos of the animals turning and goring folks. I always wanted to experience Old Faithful, and there it was, spouting away. 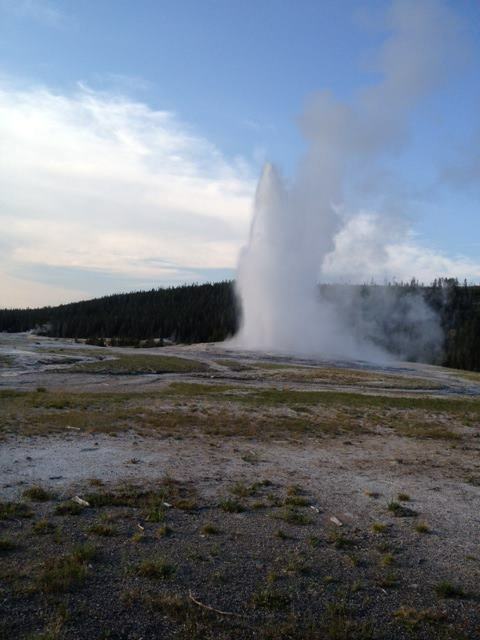 The audience of hundreds from around the globe sat patiently to watch Old Faithful do its job. Mother Nature was applauded. 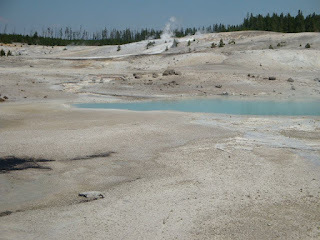 We came across hot springs, mud volcanoes, incredible rock formations and wonderful views of the history of the park system and the park rangers. Thank goodness that park rangers are protecting the park against unthinking visitors and vandals. We were constantly reminded of the active volcano beneath our tires and feet. It was very comforting to find that the caldera was only the size of Rhode Island. We next drove onward through the Grand Tetons and then the high desert plains of Wyoming. I had no idea that the center of Wyoming was a massive desert. This arid desert we discovered was the Arapaho Indian reservation. In Riverton WY, we saw the bar used by the Hole in the Wall Gang and Butch Cassidy. To get to Thermopolis WY, the largest hot springs in the world, we traveled through a gorgeous canyon where the Wind River had cut through the strata, showing hundreds of millions of years of layers that formed the mountains around us. The roads department had marked the highway with age markers along the river basin on the way to the springs. 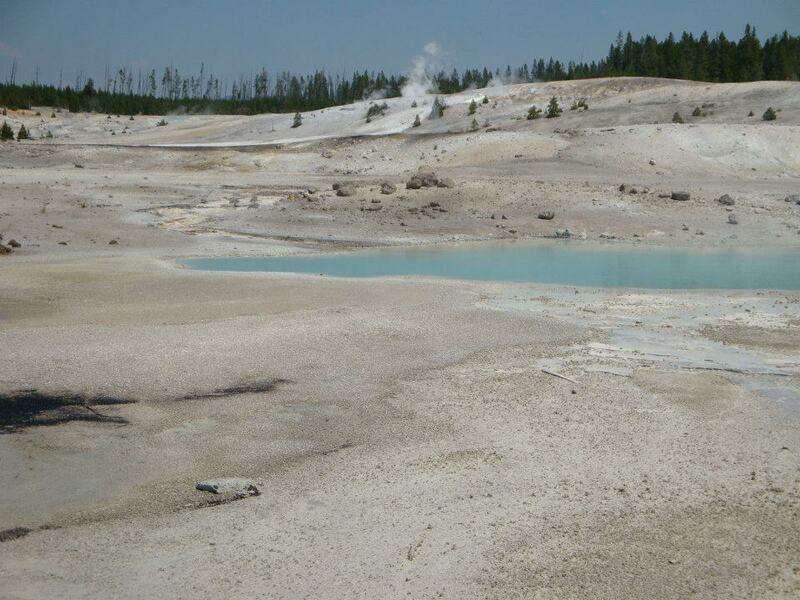 We soaked in the springs, giving us the chance to relax in the warm sulfurous waters. A tip: if you soak in the water, make sure you bring soap. Until the hotel in Casper, WY, we smelled like rotten eggs. One of my other goals was to visit a customer in the olive oil business in Caspar, but he was not available. He uses Kreinik threads to decoratively wrap the necks of his olive oil bottles. Hopefully, we can visit on another trip. Our last stop was the factory tour at Celestial Seasonings in Boulder, CO. Two things to notice here is the dress made from tea bags and the peppermint room. I sometimes have sinus problems and the Peppermint room was an intense jolt to my lungs. If you like factory tours this modern facility is fascinating, and you get to test all the teas you wish. Our trip covered 2200 miles. We tried the fare offered all though the high plains including Buffalo and Elk burgers. 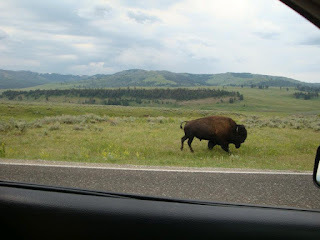 I loved the tasty buffalo burger but cannot say much for the Elk. Not being into wild game, I found the Elk to taste like sweet ground beef liver. Check out my Yelp restaurant reviews. Our only regret, as on the other two trips, we never spotted a moose. Hawaii and Alaska are my only two States left to experience, and then I will have traveled all 50. That, though, is another trip or two. Sound like a boring topic for a blog? Well sure, but every once in awhile we get someone looking for color "10m," or wondering what the "C" in 002C means. So here is a quick primer on the Anatomy of a Kreinik Thread Label. 1. The Kreinik name and crown logo. Designed over 40 years ago, that crown logo means you have the best metallic thread right there in your hands. Top of the line, high quality, you can count on Kreinik. 2. Thread Name. The label will say "Canvas #24 Braid" or "Very Fine #4 Braid" or "Petite Facets" which indicates the type of thread you have. Some of our colors, such as 002 Gold, can come in all of our metallic threads, so check the thread name to see which thread size you have. 4. The amount of thread on the spool. The "M" number indicates the amount of material on the spool. We measure by meters, so "10m" means 10 meters, "3m" means 3 meters, and so on. Have any other questions about how to read Kreinik packaging? Let us know! Our Design Coordinator Dena Lenham absolutely loves Blackbottom Cupcakes. Not only are they delicious, they are easy to make. Enjoy her favorite recipe from her dear mother. Cream cheese then add egg and beat well. Stir in chips. teaspoonful (don’t touch the paper liner). Bake at 350 degrees for 12 to 15 minutes.